Bracemasters produces high-quality metal AFOs, KAFOs, and HKAFOs using BraceTrace with far greater accuracy and less guesswork than fabrication from traditional tracings. Digital tracing allows corrections to be made to anatomical alignment, plus accurate calculation of measurements. Orthofeet is now providing an innovative Men's Fisherman design, which combines all the biomechanical features of Orthofeet's depth shoes along with the comfortable freedom and lightness of a sandal. A breathable, seamless lining, padded with foam, insures a perfectly smooth interior, providing the highest level of comfort and protection against any irritations. The shoe is made on anatomical last with 3/8-in. added depth, providing ample space across the midfoot and toe box. Additionally, the upper is constructed with an elastic element, which enables the shoe to stretch, accommodating forefoot deformities and swollen feet. Received SADMERC Code A-5500. Ongoing Care Solutions/NeuroFlex Inc. offers a complete line of orthoses, including the NEW ORTHO PROTM STABILIZERTM Knee Orthosis! This new design is an ambulating neoprene knee support and features a breathable neoprene material with front wrap closures for easy application. KWIK-SETTM hinges allow for full range of motion from 0 to 120 degrees of flexion--no tools required. 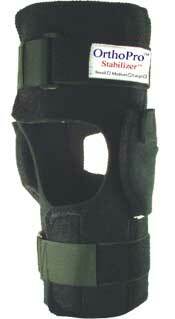 The HCPCS code for the ORTHO PRO STABILIZER Knee Orthosis is L-1832. Designed for activity level 2 and 3 amputees, SPS offers the new Endolite Navigator prosthetic foot. Worn around the home or office, shopping or visiting friends, the Navigator is perfect for everyday activities. Low ankle center improves plantarflexion at heel strike without reducing support. Ergonomically shaped keel delivers smoother rollover and deflects up to 4mm under 1000N load. Plantarflexion angle of 12° simulates natural ankle function. Low build height (3½-in. clearance) avails greater assembly options. Backed by a limited three-year warranty, the Navigator is an excellent option for amputees desiring flexibility in a stable platform. The Hosmer Oscillator Knee is a 5-Bar Glide-Flex polycentric knee with a rotary hydraulic control system. It has an independent flexion and extension adjustment and an adjustable stance flexion stability. The high-strength aluminum alloy on the Oscillator Knee is rated for 300 lb. with a one-year warranty. Its more than meets the eyethe Oscillator Knee from Hosmer. Hosmer is proud to offer the Regal Silicone Glove, a high-quality, durable silicone cosmetic covering. Regal combines the superior aesthetics of a silicone restoration with off-the-shelf convenience, durability, and price of a production glove. Available in eight different models and 18 detailed color shades. Special reinforced models have been created for myoelectric, passive, partial hands, and the X-Series with micro-pigmentation and natural hair. 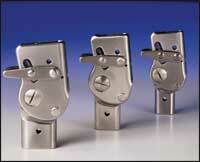 Fillauer introduces the new value-priced Cylindrical Lock. The Cylindrical Lock incorporates the dependable Fillauer locking mechanism in a versatile cylindrical body with a 4-hole attachment base. Retrofitable into other cylindrical lock sockets, the Cylindrical Lock features a fiber-reinforced, injection-molded cowl, deeper pin well for easier insertion, and stronger 4-hole attachment. It comes with two 1-in. 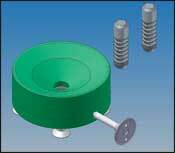 Fillauer shuttle pins and attachment hardware. SPS now offers the Trulife Matrix--the only AFO currently on the market that offers a height-adjustable tibial component, ergonomic anterior strut, and customizable anterior shell/footplate. 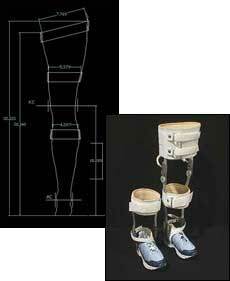 This unique design provides maximum comfort and dynamically improved gait. Matrix is applicable for patients with drop foot as a result of CVA, multiple sclerosis, other neurological conditions, ankle instability, or forefoot amputation. Anterior shell is moldable and padded to reduce tibial crest pressure. Combining Rheo logic programming software and legendary Flex-Foot® dynamics, the revolutionary Rheo Knee results in natural walking--effortless, secure--while providing simplistic programming and low maintenance for the clinician. To set up an in-house Rheo Knee training course, please call your SPS sales manager. Euro International brings you the latest in AFO technology with the carbon-fiber PEROMAX. The prepreg construction provides excellent stability and dynamic gait with a minimal weight. As a result, the PEROMAX is suitable for faster walking and higher load capacity, up to 125 kg. The Y-Shaped calf-bar allows patients with a larger calf to wear the PEROMAX comfortably. The PEROMAX can be used for peroneal paralysis, ankle-joint arthritis, and postoperative treatment of a ruptured Achilles tendon. This fine new product became available in mid-June 2006. Designed for K2 level amputees, the Navigator is the perfect foot for day-to-day activity. Around the home, office, or walking to shops and meeting friends, the "natural feel" of the Navigator encourages wearers to expand their horizons as they explore their world. 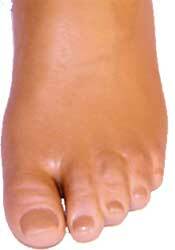 Realistic ankle joint position for a more natural look and feel. Controlled ankle motion enhanced for natural and symmetrical gait. Improved rollover characteristic given by the ergonomically shaped resilient keel. Lower build height to maximize individual assembly options. CareCredit® offers a new 60-Month Low Interest Extended Payment Plan especially for patients facing larger fees or desiring more time to pay. With rising out-of-pocket costs, large deductibles, or no insurance at all, more orthotic and prosthetic patients are looking for additional payment options. The 60-Month Plan gives patients with fees over $1,000 a convenient way, with low monthly payments, to move ahead with care. Featuring a patient interest rate of 9.9 percent, the new Extended Payment Plan has no annual fees or prepayment penalties. Marketing and presentation support materials featuring the plan are available free to enrolled practices. 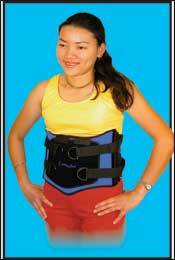 HOPE Orthopedic, the orthotic value leader, has added 3XL and 4XL sizes for its highly popular OrthoLuxTM brace. The OrthoLux now fits waists up to 61 in. and hips to 63 in. The semi-rigid LSO and TLSO OrthoLux braces are offered in seven sizes (SM through 4XL) with your choice of abdomen, lordosis, anterior extension, and over-the-shoulder straps. HOPE Orthopedic has become known for its superior customer service: Same-day order fulfillment until 8 PM Eastern, three-day shipping for the price of ground, and a flat fee of $20 for overnight shipping of the HippO or OrthoLux. Where will YOUR Fabrication be Tomorrow? Designed, programmed, and built for 100-percent OMEGA® Tracer® compatibility, the OMEGA Carver is the fastest, most economical, full-sized carver available. 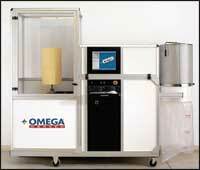 Practitioners and fabricators using OMEGA Tracer can have all their CAD/CAM needs met by one system and provider. Featuring a 3-axis carver, the OMEGA Carver can create BK, AK, AFO, and spinal shapes as much as twice as fast and at twice the resolution of other carvers. Safety features include a vertical carving chamber that pulls dust away from the door. Debris collection system offers quick and easy cleanup. The new Otto Bock 17LK1 Unilateral Joint System features a one-of-a-kind weight classification. This unique system is designed to help orthotists fit a variety of patients while maintaining a small inventory. The concept gives orthotists flexibility to configure a variety of options depending on the patients needs. The 17LK1 Unilateral Knee Joint allows easy replacement of all moving parts to shorten bench time. The product offers many configuration choices, including a lever lock, a cable control, or a free-moving joint positioned posterior to the weight bearing line. The posterior position eases flexion and unlocking through the biomechanical design.